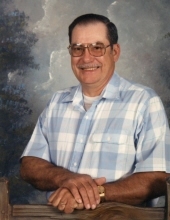 Celebrating the life of Donald Wayne Boltz, Sr.
Obituary for Donald Wayne Boltz, Sr.
Donald Wayne Boltz, Sr., age 83 years, a resident of Beverly, WV departed this life Sunday evening, March 24, 2019 at his home, surrounded by his loving family and under the care of Mountain Hospice. He had been in declining health. He was born Wednesday, October 9, 1935 at Calhoun County, WV a son of the late Emmanuel Davilla “Bill” and Ethel Jane Shimer Boltz. On February 15, 1957 at Red House, MD he was married to the former Polly Mae Minear, who survives. They had celebrated sixty-two years of marriage. Also surviving are one son, Donald Wayne Boltz, Jr. and wife Barbara of Beverly; Mary Boltz of Beverly; three grandchildren, Andrea Boltz, Miracle Boltz, and Bryon Boltz; one great grandson, Mason Ketterman; and several nieces and nephews. Preceding him in death are two brothers, James Robert Boltz, and Harland Guy Stalnaker. He attended the schools of Beverly and was a veteran of U. S. Army for five years during the Korean Conflict. He had worked for Cupp’s LP Gas and Southern States before moving to Pontiac, MI in 1965, where he worked as a truck driver in motor car transport for Anchor Motor Freight, retiring in 1996 with over thirty years of service. He had worked as the Manager of the Super Car Wash for over twenty years. He attended the Tygarts Valley Baptist Church and the Refuge Church. He enjoyed traveling with his family, NASCAR races and spent a lot of time on the farm helping his mother. The family will receive friends at the Lohr & Barb Funeral Home of Elkins from 5 to 7 PM, Wednesday. Final Rites will be conducted at the funeral home, Thursday, March 28, 2019 at 12 Noon. The Rev. Kevin Gainer, the Rev. Jack Howell, and the Rev. Bryan Headley will officiate and interment will follow at the American Legion’s Little Arlington Cemetery at Cravensdale, WV where the WV National Guard Honor Guard Program, the H. W. Daniels Post # 29, American Legion and the Tygarts Valley Post # 3647 Veterans of Foreign Wars will conduct full military honors. To send flowers or a remembrance gift to the family of Donald Wayne Boltz, Sr., please visit our Tribute Store. "Email Address" would like to share the life celebration of Donald Wayne Boltz, Sr.. Click on the "link" to go to share a favorite memory or leave a condolence message for the family.